When you walk under the archway into the chic courtyard at Marco Pierre White in Donnybrook it is hard to believe that this once housed a humble green grocers. This deceivingly large space is quite the surprise. We decided as it was such a beautiful evening we would take advantage of the recently added heated terrace and enjoy a glass of Albarinho while we waited for our table. There is no doubt the additional seating on the terrace area was a smart move, as the Thursday evening we dined there the restaurant was full to capacity, clearly this is a popular neighbourhood restaurant. Being a bar and grill restaurant it is no surprise to see Irish beef featuring heavily on the menu along with some nice roasts such as the Rump of Wicklow Lamb or the Grilled Veal. The Courtyard offers an excellent early bird menu with 3 courses only setting you back €26.95 , the unusual thing is this offer is available all night Wednesday, Thursday and Sunday which you don’t see often. We settled on a couple of light starters, Fresh Asparagus and Hollandaise sauce, which was blanched perfectly and a Chicken Liver Parfait with raisins in a sweet madeira jelly and some toasted brioche. We were assured by our server Celine that the Ribeye Beef was one of their standout dishes; true to her word a succulent, well portioned 10oz steak arrived drizzled in a classic Béarnaise sauce, served with crunchy triple cut chips, not good for the heart but boy did they taste good. Roast chicken is one of those dishes you seldom see on menus these days but no denying we all love from time to time, Marco Pierre White’s Poulet Vert was moist and well seasoned with a delectable crispiness to the skin, accompanied by a huge fondant potato and a citrusy lemon mayonnaise. 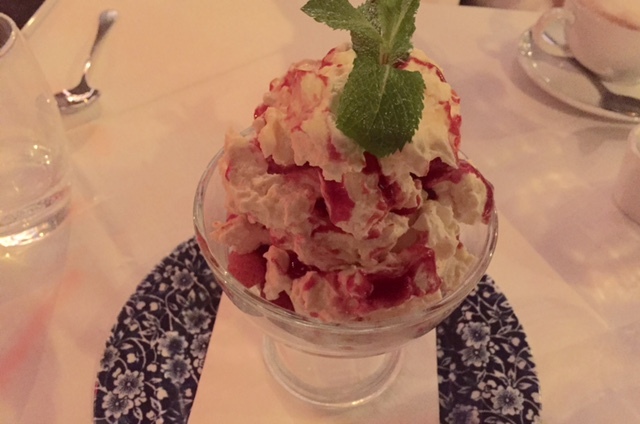 Dessert was a good old staple, Eton Mess, a calorific blend of Irish strawberries, meringue chunks and lashings of syrup. Sinfully good, all that remained was a clean glass! It is easy to see why there was so many “regulars” dining here, when people find a spot that’s comfortable, stylish and serves good quality, honest food it becomes a fast favourite. No wonder that the man himself is happy to have his name above this door. This is a Beef Lovers Taste we highly recommend.